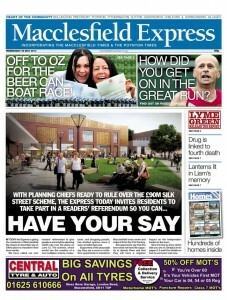 The Macclesfield Express has launched its own referendum over a proposed £90m redevelopment of the town centre. At the moment, the town is split, with some believing the plans represent a once-in-a-lifetime opportunity, while others think they’ll harm business for local traders. It’s why the paper’s editor, Gareth Tidman has called on readers to get involved to send a message to the local authority before they make a final decision next month. "This is one of the biggest decisions affecting Macclesfield and we will be living with the outcome for years to come,” explained Tidman. "As a paper we have taken a strict neutral stance on the scheme, but felt that it is important the people of Macclesfield get the chance to say whether they want it or not. "There is genuine excitement in the town over how our poll will go." Readers vote by filling in coupons printed in the paper and returning them to the newsroom. No photocopies are allowed and only one entry is allowed per envelope. The referendum was launched with a front page appeal as well as 3 pages inside dedicated to the arguments for and against. Tidman added that newspaper sales were boosted last November when the Express published an 8-page pull-out on the proposal, which includes a new multiplex cinema, restaurants and shopping parade.